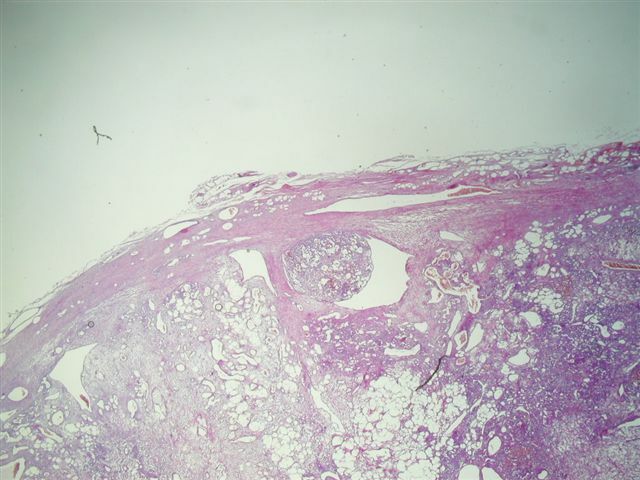 These cases can also be accessed by clicking on the Case of the Week button on the left hand side of our Home Page at www.PathologyOutlines.com.� This email is only sent to those who subscribe in writing or by email.� To view the images or references, you must click on the links in blue. 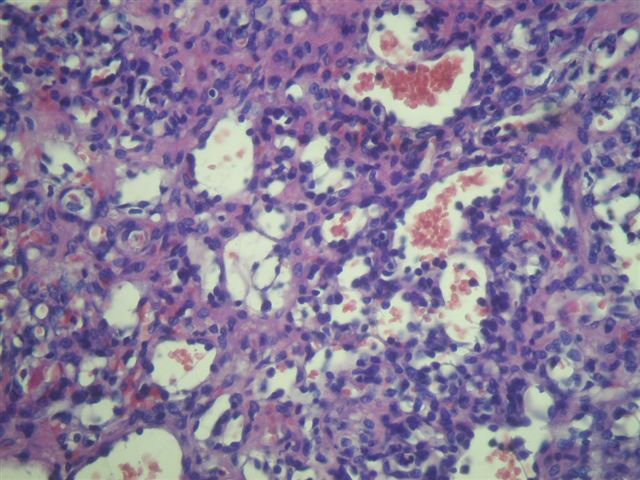 To subscribe or unsubscribe, email NPernick@PathologyOutlines.com, indicating subscribe or unsubscribe to Case of the Week.� We do not sell, share or use your email address for any other purpose.� We also maintain an email list to receive a biweekly update of new jobs added to our Jobs page, and an email list to receive general information every 2-3 months about changes made to the website.� You must subscribe or unsubscribe separately to these email lists. This week�s case is sponsored by Invitrogen.� Invitrogen offers Zymed� total system solution for pathology reagents and automation.� From antibodies, kits and probes for IHC and CISH� to immunostainers for automation, you can be confident that Zymed� products will always deliver high quality staining results and offer the cutting-edge pathology solutions you need. �Visit www.Invitrogen.com/pathology.� Note: sponsors do NOT have access to email addresses or other personal information in the possession of PathologyOutlines.com. 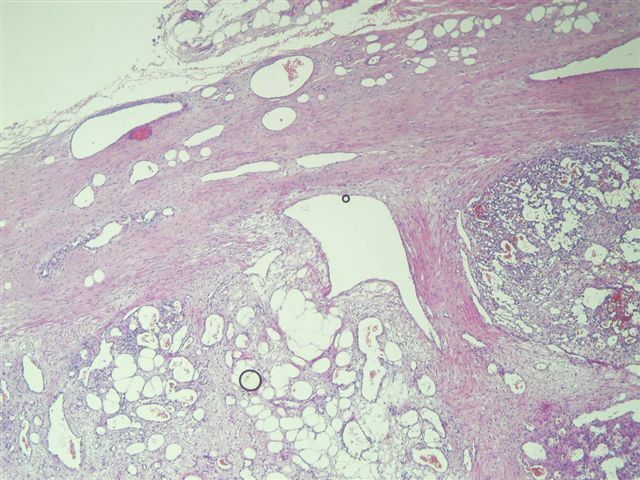 A 56 year old man had a retroperitoneal mass behind the pancreas and in front of the inferior vena cava.� The clinical impression was schwannoma versus sarcoma. 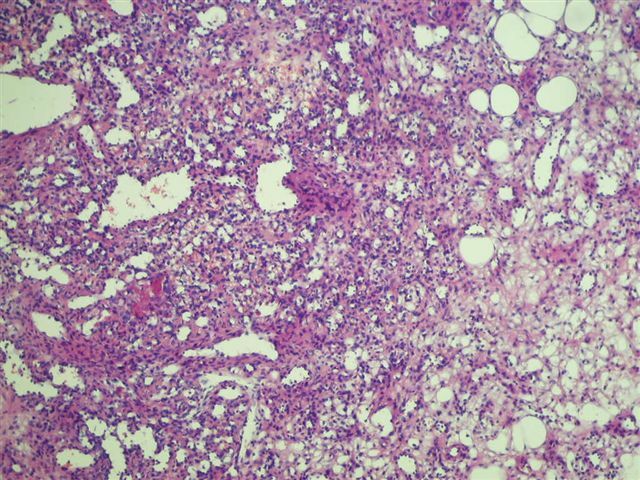 Gross: The specimen consisted of three irregular fibrofatty fragments, the largest 5 cm and the others being very small.� Sectioning revealed a well circumscribed yellow-gray myxoid mass measuring 3 x 2 x 2 cm.